Taken from: Universal Yarn's The Loft Collection "Intersection Jacket" - This pullover is worked in pieces. 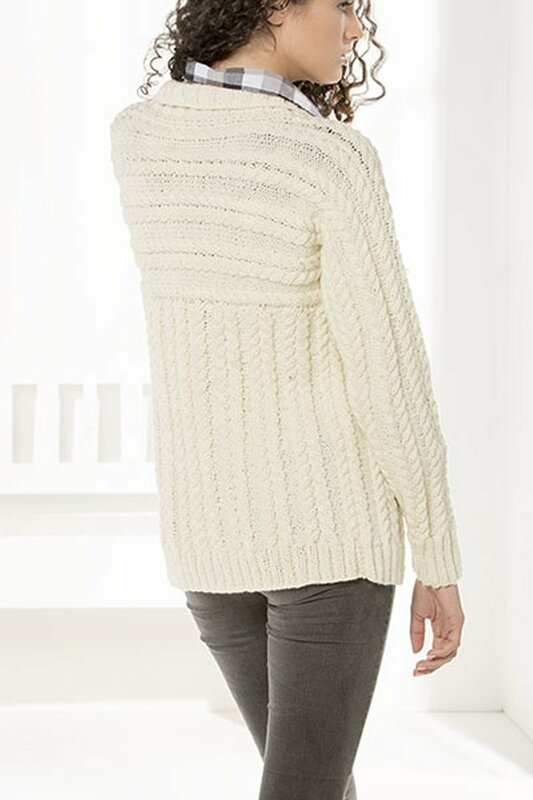 The sleeves and upper body are knit sideways in one piece. Stitches are picked up from the sides of the upper body and the lower body is knit downward. This pattern is from Universal Yarn's The Loft Collection "Intersection Jacket". US Size 6 (4 mm) and US Size 4 (3.5 mm) straight needles (or size needed to obtain gauge) are required but not included. Finished Bust Measurements: 33 (37, 39, 41, 45, 48)"
Gauge: 26 sts over 4". Color shown is 101 Vanilla.